One of the suspects identified by Turkish authorities in the disappearance of Saudi journalist Jamal Khashoggi had ties to Saudi Crown Prince Muhammad bin Salman, the New York Times reported on Wednesday. 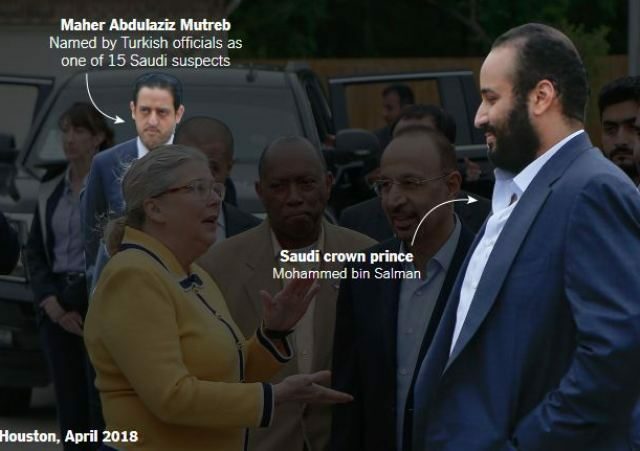 “The New York Times has confirmed independently that at least nine of 15 suspects identified by Turkish authorities worked for the Saudi security services, military or other government ministries,” the report said. One of them, identified as Maher Abdulaziz Mutreb, was seen disembarking from airplanes with Saudi crown prince in Paris and Madrid and was photographed standing guard during his visits this year to Houston, Boston, and the United Nations. Turkish officials released a photo of him at the Istanbul airport, naming him as part of a team of Saudi agents who allegedly assassinated Jamal Khashoggi. International news outlets have quoted Turkish government officials as saying that Khashoggi was killed inside the Saudi consulate and his body was cut into pieces. The Saudi crown prince and his father, King Salman, have denied any knowledge of Khashoggi’s whereabouts. The New York Times said that Saudi officials did not respond to requests for comments for this story.